Little more than two hours from Paris by TGV, Strasbourg is an inspiring city with an age-old centre, a go-ahead culture, chic boutiques, High Street stores, and a wealth of fine dining and high-end restaurants serving imaginative offerings of regional and international dishes. Paradoxically, in spite of the bustle, a good way of understanding Strasbourg is to do nothing more demanding than to perch at one of the street cafés in the cobblestoned Place de la Cathédrale and just watch (and listen) as the world goes by. 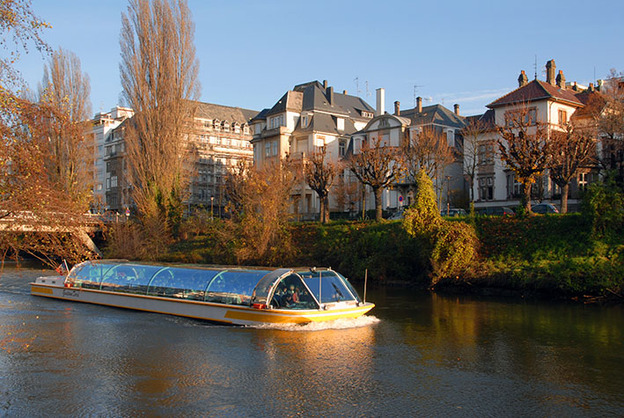 Beyond that, the particular appeal in Strasbourg is the ease with which you can get around. Walking, of course, is always the most edifying way of discovering any city, and you can take a pedestrian tour with an audio guide if you want to be sure not to miss anything. Or, these days, a personable Cariboo guide will serve equally well: the petite and easy-on-the-eye Justine offers classic city tours, including the Golden Square, cathedral and European Parliament for €12 per hour, while the equally charming Marion offers local foodie tours for €14 per hour. The excellent tramway system is superb for getting all across the city and out to the suburbs, especially for those in search of less pricey hotels. Five tram routes criss-cross Strasbourg linking with the suburbs and warden-controlled park-and-ride areas for those that arrived by car. Of course, there are the customary tourist trappings from water boats with panoramic windows and audio commentary systems to a mini-tram that pootles about the city streets in a leisurely and moderately aimless kind of way. The ancient city, a World Heritage Site, stands islanded in the River Ill. At the south-western corner is La Petite France, an eye-catching and winning quarter in the past occupied by fishermen, millers and tanners. Today, its glory is its wealth of half- timbered houses, many dating from the 16th and 17th centuries, among which La Maison des Tanneurs dates from 1572. Close by, the fascinating Ponts Couverts was a wall-bridge built in the 13th century, originally from wood and covered with tiled roofs, hence the name. The stone bridges you see today are from the 19th century. Facing them is the Barrage Vauban (the Vaudan Dam), built after Strasbourg became part of France in 1681; beneath its 13 arcades floodgates could be closed to flood the southern part of the city as a defensive system. The panoramic terrace provides a great view over La Petite France, and the dam looks especially attractive at night. Central to the city is La Place Gutenberg (Gutenberg Square), the former centre of political and social life, and features a number of striking buildings, as well as a statue of the eponymous Johannes Gutenberg, a German blacksmith, goldsmith, printer and publisher, who introduced printing to Europe. Not far from the cathedral, the Maison Kammerzell many would agree is the most beautiful building in Strasbourg, having been built in the 16th century, and later owned by a grocer, Philippe Kammerzell. Today, it sees service as a restaurant, and overlooks the great square in front of the cathedral, founded in 1277 and a remarkable architectural achievement with an exceptional collection of stained-glass windows, and a renowned astronomical clock. Among many, there are two particular museums well worth visiting: Le Palais Rohan, sequestered in a building very much of the Parisian style, was built between 1732 and 1742 as the residence of the Prince-Bishops. 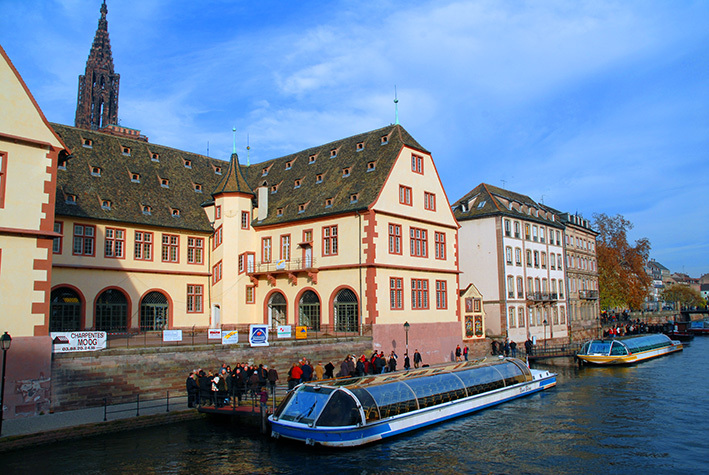 Now, it houses the Decorative Arts Museum, the Fine Arts Museum and the Archaeological Museum. The Musée Alsacien, a folk art museum featuring rural costumes and ways of life, is found across the Pont du Corbeau, and was established in 1907 in three beautiful Renaissance houses. 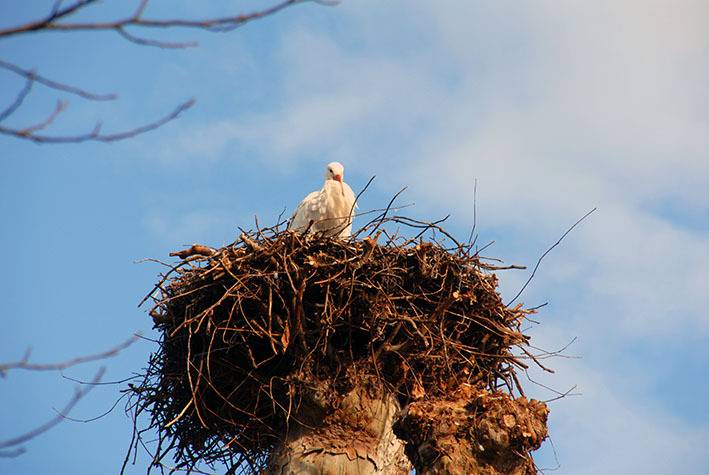 Should you want to stretch your legs a little, then grab a map from the tourist office and figure out the way to the Parc de l’Orangerie, which is not far from the various European buildings for which Strasbourg is distinguished. You can take Tram E to Droits de l’Homme station, but it is so much nicer on a sunny day to follow the Ill, and then cut through to the Avenue de l’Europe and enter the park. 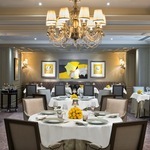 This is a lovely place, with a children’s play area, lakes, an aviary, storks nesting atop chimney pots, a Michelin-starred Restaurant (the Buerehiesel) and another, Le Jardin de l’Orangerie, that offers no pretension, just excellent and inexpensive set lunches – right next to a ten-pin bowling alley. As with every French town and city, events from puppet shows and flea markets to beer festivals and orchestral concerts, feature throughout the year. 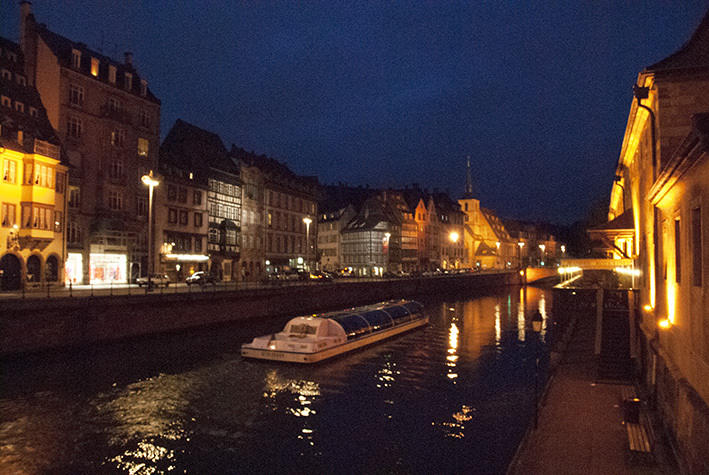 But it is at the end of November that Strasbourg especially comes alive. 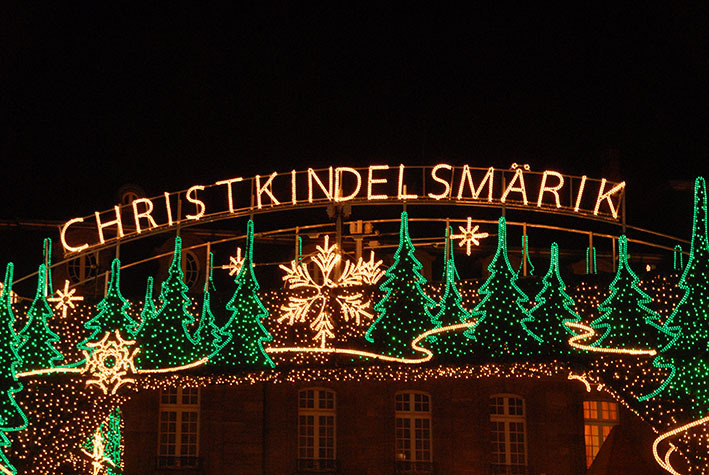 For that is the time, through December, when the world-celebrated Christmas Market (Christkindelsmarik) is held, a feature of the Strasbourg scene since 1570, and by far the best Christmas market in France. 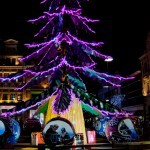 Baubles, bangles and bright lights bring an other-worldly gaiety to the city as the whiff of spices, roasting chestnuts (marrons chaudes) and mulled wine drift on the air. This is the time when everyone goes back to their childhood, and the kids hang around looking embarrassed by the antics of their parents. Relatively compact Strasbourg may be, but one thing is certain, you will need to come again. One visit can never be enough. Tourist information office: 17 place de la Cathédrale, 67082 Strasbourg, France. Tel: +31 3 88 52 28 28; . Cariboo city guides: Tel: +33 1 76 35 01 57; www.cariboo.co. 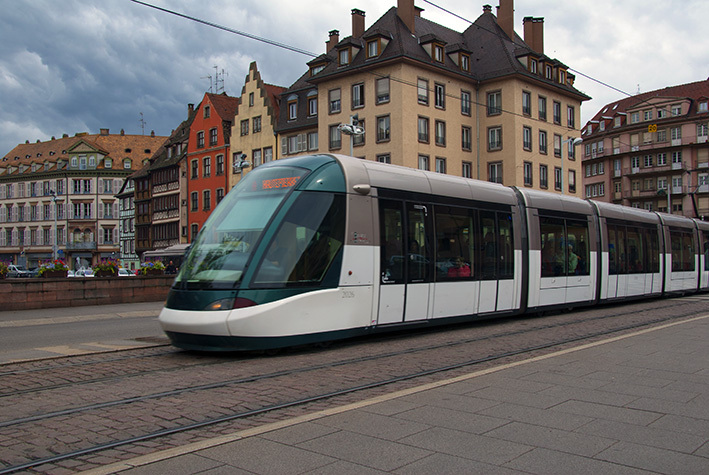 Strasbourg enjoys a central position making it easy to reach many towns and cities. 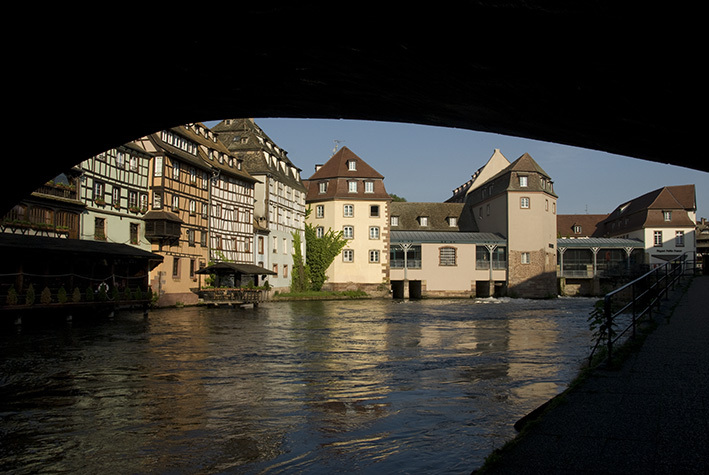 Just a few hours by road or less than one hour by plane from Paris, Lyon and major German cities, Strasbourg is well served by the motorway, air travel and train network, although there are no direct flights from the UK. 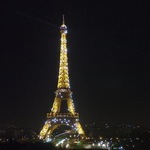 By train:Paris Est-Strasbourg in 2hr20, with 16 daily returns services. Tel (from France): 3635; Tel (from overseas): +33 8 92 35 35 35; www.sncf.com or https://uk.voyages-sncf.com. By air: Strasbourg-Entzheim International Airport, Route de Strasbourg, 67960 ENTZHEIM (Tel +33 3 88 64 67 67; Email: information@strasbourg.aeroport.fr; is just 10 km from Strasbourg town centre via the motorway.